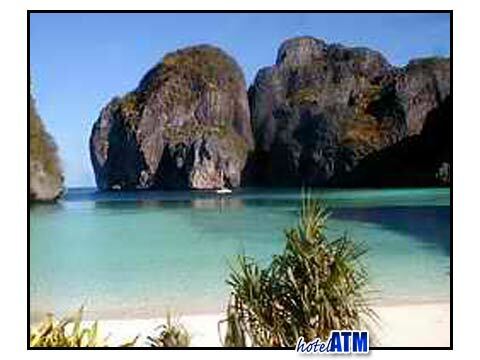 We are often asked if there are any out of the way budget resorts and I immediately think of Phi Phi Relax Beach Resort. The resort is tucked away on the east coast and often passed on the way up to Bamboo Island, but few, if any, just stop here and take it all in. As you arrive from Krabi you actually passed the Phi Phi Relax Beach Resort on the way round to the main town. All you see is a verdant mountainous jungle and you have to look carefully to see some brown grass covered bungalows along the sea shore. Hidden away on a very quiet part of Phi Phi Don makes the resort ideal for those who want a real experience of peace and quiet, a through back to the way many of the family run bungalows used to be in the 1980's. The resort keeps this charm but graces the rooms with more style and the comfort required. the resort has a huge variation of fan bungalow types. These reflect the stages in development of the resort and their position on the beach. The bungalows range from the simple 32 m2 Garden bungalows to the 40 m2 Paradise Beach Bungalow. All the bungalows are within 3 rows of the fine gold sandy beach. The fresh water for the showers come dancing down the mountain side and is pure and clean. The bungalows are fan but are cooled by the on shore high season wind. Still you need to be able to enjoy a mosquito net and fan to get the best out of this resort. The beach is the best activity at the resort. Palm covered and cool the Pak Nam beach is the perfect place to idle away a day or two, day dreaming, reading or just listening to the sound of the waves. The tidal beach has a pretty coral garden just 100m out to sea and although just a small part of a 6km coral reef, it is surprising what marine life is to be seen. The Phi Phi Relax Beach Resort tripadvisor and phi-phi.com reviews of the resort show an average: 3.7 out of 5 which makes this the best reviewed resort at 2 star. Phi Phi Relax Beach Resort focuses it's main deals in the months of May through till October however there is a Long Stay deal only at phi-phi.com for those staying 15 nights or more. It is worth looking through the different month deals as they vary quite considerably. As you would expect the Phi Phi Relax Beach Resort is not just at the end of a simple boat ride, there is more to it than that. Like all good things, you have to work for it a bit. Still, it is fairly straight forward and you can get to Phi Phi Don Main pier from Phuket Rasada Pier (Phuket International Aiport, 12 flights a day from Bangkok), Krabi (Krabi International Aiport, 6 flights a day from Bangkok), and the ferry from Koh Lanta. From here the resort organizes a longtail boat transfer which takes about 15 minutes. See the Phi Phi Phi Phi transfer to organizing this.